There are currently 90,546 users on this website. Images two ways, axial and regular. Does the OGP label say "uncirculated"? I'll say MS64 maybe PL. I'll also say 64 but not sure the obverse is PL. Stunning coin. I'll stay with 64 - but remember PL isn't for frosted devices it is for the depth of the fields if they are mirrored. Toned GSA's will not have the UNCIRCULATED type holder unless they toned after holdering. And that is the reason I asked. This coin is original bag toned, as it is in a generic SILVER DOLLAR style holder. I've only seen a few toned coins in UNCIRCULATED type holders and they all had almost target toning, and none had anything remotely near rainbow colors. 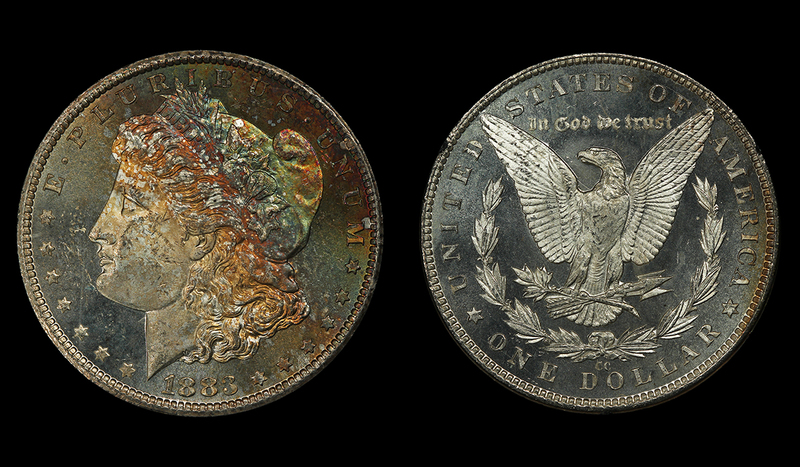 I suppose, with long enough and in the right environment, you could reproduce toning like this in an UNCIRCULATED type holder, but I dare say that will not be within my lifetime. 63-64 sounds right. fields look unmarked but cheek shows some hits.